If you want to know what A Broadleaf and Conifer Garden is, visit page 23 in Gardening from a Hammock. What is so great about this kind of garden, you may ask? Jim Lounsbery will tell you that broadleafs provide winter interest, texture and colour, and many have lovely spring flowers. As well, many are low maintenance, adapting to either sun or shade, good or poor soil. They are ideal for low maintenance gardening. 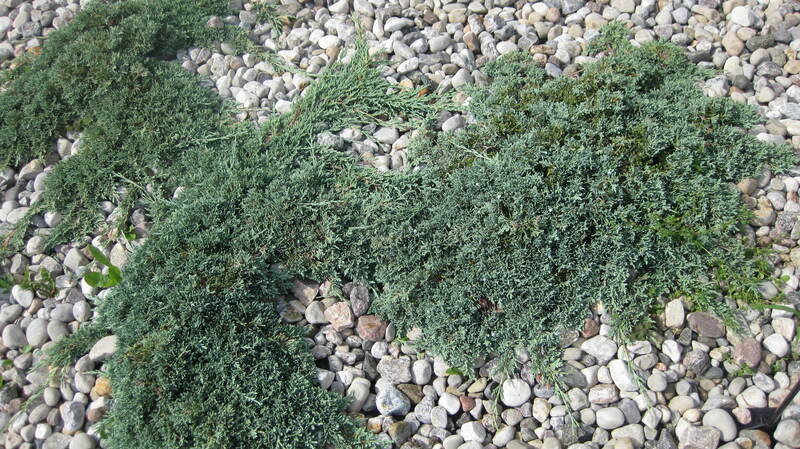 Juniperus horizonatlis "Monber', also called Icee Blue creeping juniper, can be used as an accent plant, a groundcover, in a rock garden, is drought tolerant, and provides winter interest. Broadleaf evergreens and conifers are definitely considered the backbone of the garden. They come in all shapes, colours and textures, from miniatures to giants, and some change colours, and Jim know them all. Jim Lounsbery’s Vineland Nurseries specializes in dwarf and unusual evergreens, Japanese maples, bamboos, rhododendrons and heathers. He can be reached at jlounsbe@ vaxxine.com or http://www.vinelandnurseries.com .